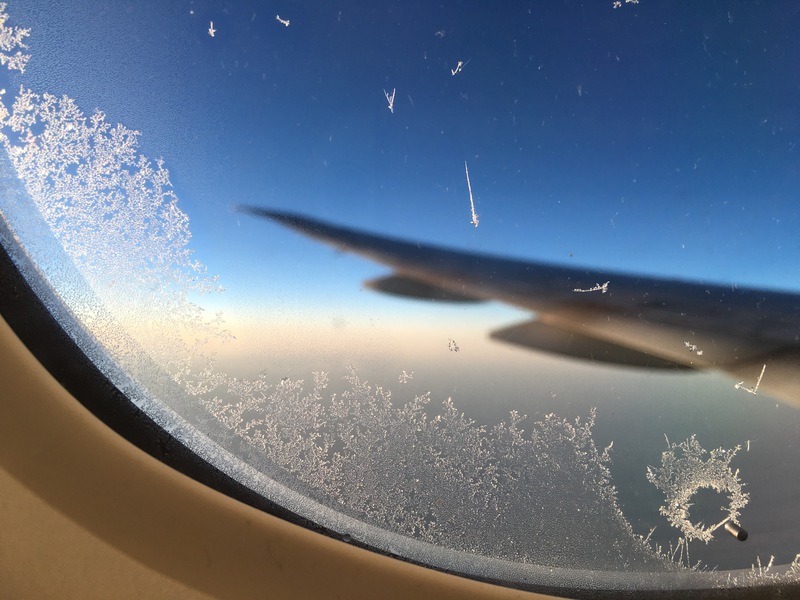 I’m writing this at 32,000 feet, and there are ice crystals on the window. This is our first flight on a Boeing 777-300-er. We’re in 56A & B. Seat C was empty which provided a few extra options for sleeping. Leg room is pretty good and the in-flight entertainment is impressive. I was skeptical, but with an iPhone loaded with podcasts, and dozens of movies on demand, games and albums it’s a far cry from the two movies per leg and 50 minute tape loops of 20 years ago. I’ve watched Man Of Steel (routine), Age of Adeline (nice), Fantastic Four (routine) and Inside Out (brilliant). For that last one I worked out how to get two screens in sync so we could watch it together. The couple in the next row had interesting choices. He chose the chick-flick How To Be Single. She went for the documentary. Go figure. The food was also a surprise on this flight, and on the first leg from Auckland to Hong Kong. It looks a lot like the unnoteworthy food of yesteryear, but I’d rate this as memorable. How they can pre-make an omelette, and it still tastes great after reheating I don’t know, but to some food technologist somewhere, thank you. So they have wifi on board these days? That’s pretty cool. Is presume you’re with Cathay Pacific if you’re flying via Hong Kong? I wrote in the air, posted it on the ground. Podcasting – Hype or New Hope? Restructuring: What is it good for?